Mr. Robert Robinson '78 (LISTEN) returned to lead the Viva City Choir of over 600 students on April 25th. The Henry Hall of Fame honoree reflected on his participation on the Speech Team while at Henry. "Connie Blom, my Speech Coach gave me confidence I didn't have myself, and the inspiraton to do whatever I wanted to do. I was shy. If not for Speech I would have come and gone without ever being noticed..." An audience of 1,800 noticed on April 25th, including Senya Simpson-Christensen '15. I watched the soloist wait for the conductor’s direction. The conductor nodded and the band began to play. He signaled the choir and we sang in a hush, “Ingonyama, nengw enamabala. Ingonyama, nengw enamabala.” The soloist began to sing the lead, “Night and the spirit of life calling...” I stared at him in awe. His voice was incredible; it was rich and honest. As the song went on, joy flooded over me. Our voices blended perfectly, the soloist’s flowing over our sound like a wave of golden-brown silk. “Oh, oh, eyo.” We sang intensely in the background. “Oh, oh, eyo.” The sound was unbelievable. The song ended and the entire gymnasium broke out into self-appreciative applause. The soloist told us of his life and his experience with singing. He had no vocal training. He sang because he enjoyed it. The soloist asked us if we had any questions. He called on a boy who suggested, “Sing us something!” A chuckle rippled through the bleachers and the soloist smiled. “That’s not a question.” It wasn’t, but I and I’m sure most of the room wanted him to sing again. The soloist said, “Well, I’ll sing a little bit of Amazing Grace.” My eyes widened and I whirled around to give Maddy an excited grin. I turned back to watch the soloist. The room fell silent as we waited for him to begin. The soloist closed his eyes, his eyebrows drawn in slightly. Then, he began to sing. “Amazing Grace... How sweet... The sound.” Almost every word was full of beautiful runs. Between words, he would pause for just so long that each pause was filled with a still silence, so quiet that you could hear a pin drop. Just so long that I could sense that everyone in the room felt the same way I did. They wanted to pull the words from his mouth and make him sing them. In the moments that he paused, we were desperate to hear more. The soloist continued the song with spectacular power, his voice filling the whole gymnasium. A lump formed in my throat as I watched him sing. There was so much emotion in his voice and his words and on his face. I held onto every word he sang and hoped that he would continue to sing. An awed grin broke across my face. At last, the soloist finished the song with a perfect, soft note. The room erupted with applause and cheers. I clapped for him, beaming, and tears began to run down my cheeks. I had been moved to tears. 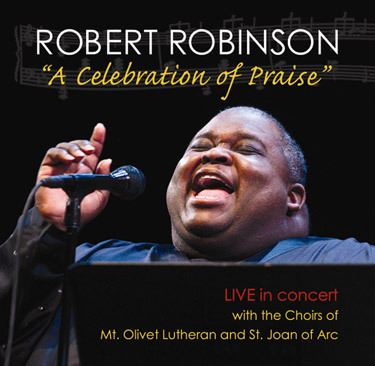 Robert Robinson was incredible at our Viva City rehearsal. I tried hard to put into words all of the emotions filling the gym and my heart when he sang for us. He’s singing with us for one song at Viva City. I know he will be just as incredible at our performance tonight. Thank you for joining us this evening. - Senya Simpson-Christensen, Patrick Henry H.S.